It’s worth noting at this point that everything I’ll be going through in this guide will be from the perspective of an Azure Stack admin. I’ll be uploading a guide at a later date to step through the creation of Plans, Offers and Quotas and how we use these to offer out some of this guides services to our tenants. Disk drives: General Azure Stack POC Data* 4 disks. Each disk provides a minimum of 140 GB of capacity (SSD or HDD). All available disks will be used. 4 disks. Each disk provides a minimum of 250 GB of capacity (SSD or HDD). All available disks will be used. You can find some instructions for checking if your CPU is SLAT capable HERE – I’d suggest it’s probably easier just looking up the manufacturer specs of your CPU instead though. If your server meets the recommended resources detailed in the above table, you’ll be able to deploy all the items listed in this guide, however, if you also want to deploy some of the services from the market place, you may need a little more. You can check the viability of your physical host by downloading and running THIS PowerShell script provided by Microsoft. Any disks you use must be of the same type (SAS or SATA) and if you’re using SAS they’ll need to be connected via a single path as MPIO (Multi-Path IO) is not supported. *NOTE: RAID controllers that cannot be set as “Pass-Through” will not recognise the disk media type. For that reason, both SSDs and HDDs will be presented to the OS as “Unspecified”. When you go on to deploy Azure Stack in this scenario, both SSDs and HDDs will be used as persistent storage and you’ll be without a cache layer. The operating system you install on the host should be 2012 R2 or later. This OS isn’t the one you’ll be going forward with though as one of the first steps in the deployment is to set the host to boot from a preconfigured VHDX. Microsoft have provided a PowerShell script you can use to check the viability of the hardware you’re using for your Azure Stack deployment. You can find it HERE. We’ll be making use of this method in the guide. You’ll be asked to provide the details to an account within your Azure Active Directory during deployment but as above, you’re Azure Stack server will need internet access for this. If you already have an Azure AD account that is the directory administrator for at least one Azure AD, you can use this, alternatively, you can create a free Azure account HERE. NOTE: I’ve just noticed that if you’re in China, you’ll need to follow THIS link instead. 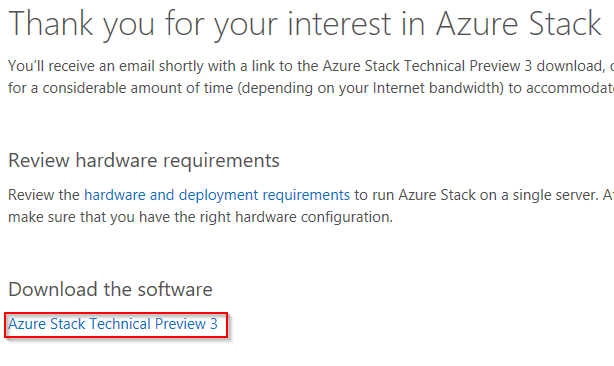 You’ll also want to create an account to connect to Azure Stack as a tenant, but we’ll cover that later in the guide. The Azure Stack deployment comes with its own ADFS and Active Directory Domain Services (ADDS) instances. So this option would be your choice if your Azure Stack server either doesn’t have internet access or you don’t want to (or don’t have) use Azure AD. The networking requirements for the Azure Stack POC are fairly straightforward, you’ll need a single port on a switch and it doesn’t require any specialised features. The port can be configured as either an access or trunk port. Either way, I’d suggest setting the VLAN as “Native” on the port as it’ll save you specifying the VLAN ID during the Azure Stack deployment. You can either provide your Azure host with an IP using DHCP or it can be statically assigned. You will have to provide the static IP details when running the Azure Stack deployment script, but we’ll cover this at the time. As explained above, most Azure Stack POCs will be deployed with access to the internet (ports 80 and 443 required). This access needs to be direct or via a transparent proxy. The physical host you’re using will need to have .NET Framework 4.6 or later installed. CloudBuilder.vhdx – This virtual disk contains a partially configured OS drive that will form the basis of our Azure Stack POC server. BootMenuNoKVM.ps1 – A PowerShell script to prepare the physical host to boot into the CloudBuilder.vhdx, used if no KVM to the host is avaiable. 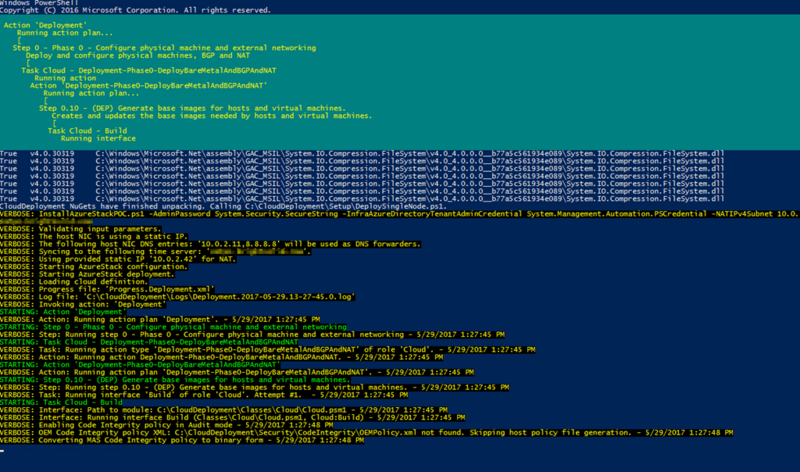 unattend_NoKVM.xml – The unattend file paired with the above PowerShell script. PrepareBootFromVHD.ps1 – Same as above but assumes you have KVM to the physical host…the method I’ll be using in this guide. Unattend.xml – The unattend file paired with the above PowerShell script and the one we’ll be using in this guide. Once downloaded, click “Run” to launch the Self-Extractor, as it’s about to inflate a file from 15.5GB to just under 40GB, it’ll take a while. Run through the wizard and select an extraction location that has at least 40GB available. The rest of the files we’ll need can be downloaded using some PowerShell provided by MS.
PHEW, that about covers it for the prerequisites. Let’s move on to the fun part…the deployment. The following process assumes that you have KVM (or direct console) access to the physical host as you’ll need it to continue. Now log onto the host as the local administrator. .\PrepareBootFromVHD.ps1 -CloudBuilderDiskPath C:\CloudBuilder.vhdx -ApplyUnattend -AdminPassword "LocalAdminPassword"
The server will now be set to boot from the CloudBuilder.vhdx file. ‘Performing the operation “Enable the Local shutdown access rights and restart the computer”’’ – Select “Yes” and the server will reboot. Jump across to your KVM and launch a console to the physical host. Once the server is up and running, log on as the local administrator using the password you specified in the PowerShell above. 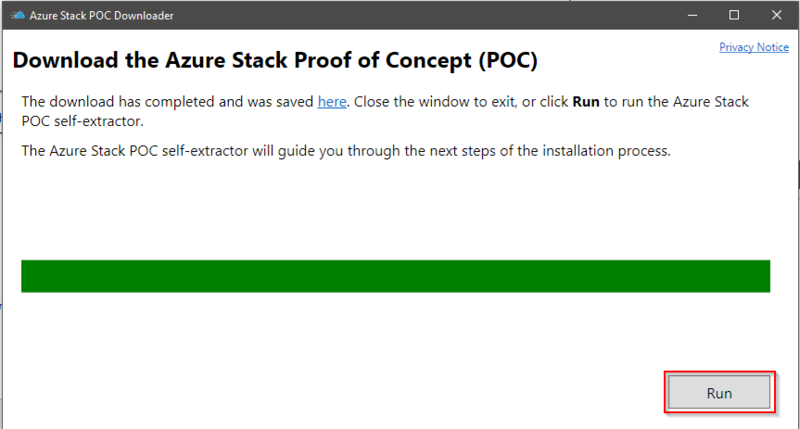 We’re almost in a place where we can kick off the Deployment of Azure Stack itself. Before that though there are a few things we need to/should do first. If you’re not using DHCP, configure a static IP and DNS server(s) on the remaining enabled NIC. When it comes to deploying the App Service later, I’ve found that this’ll fail unless the Time Zone is set to “(UTC) Coordinated Universal Time”. I’ve also found that leaving the NTP server as “time.windows.com” gives me inconsistent results. With this in mind, let’s change them both before continuing. 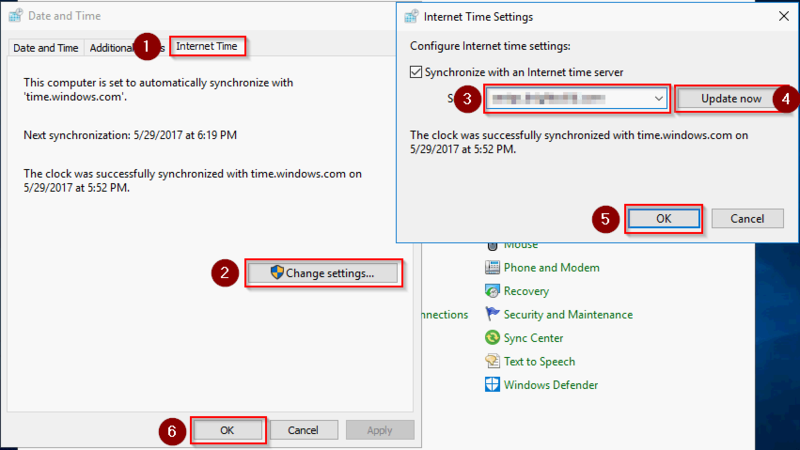 Change the NTP server to one of your choice and click “Update now” – if this step fails to sync, just click it again. Now click “OK” twice to exit. 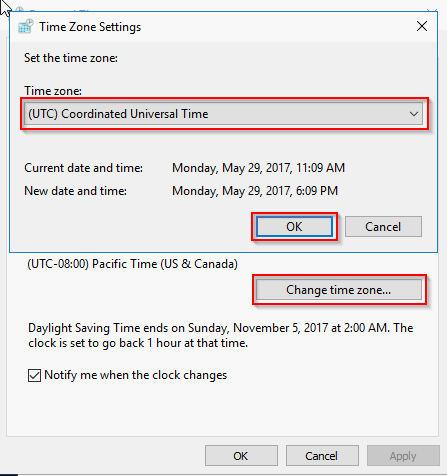 Now that we’ve sorted our time zone and time, we’ll want the VMs that are spun up during the Azure Stack deployment to inherit these settings from the host. We can make sure this happens by enabling the “Time Synchronization” integration service on the VMs. 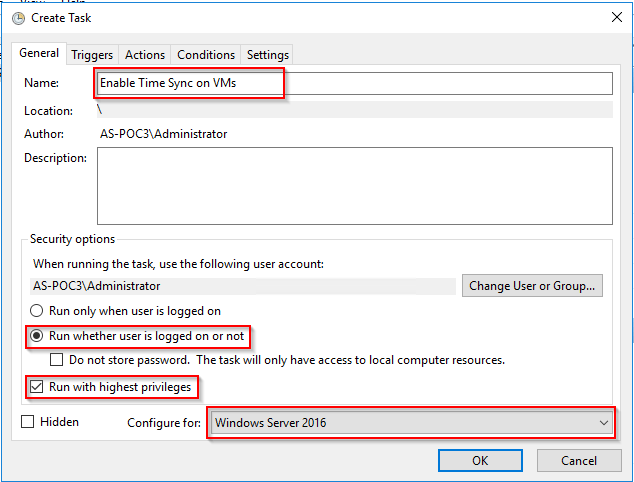 I’ve elected to do this by creating a PowerShell script that checks all VMs for any where the Time Sync service isn’t enabled and enables it, it’ll also update the time zone for any VMs deployed to UTC. This script runs as a scheduled task that executes it every 2 minutes for 24 hours…it seems overkill but just in case your Azure Stack deployment is REALLY slow. NOTE: when you click “OK” to save the task, you’ll be asked to enter the password for the current user, in this case the local administrator account. 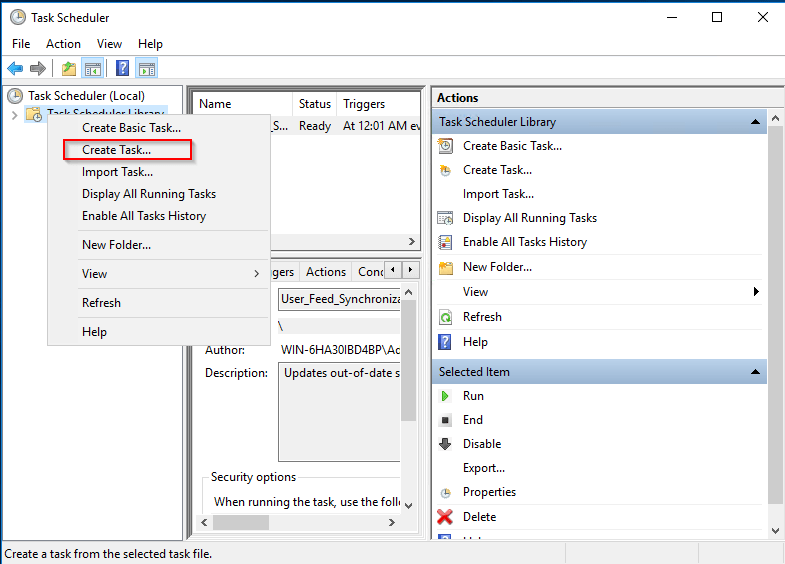 Now right-click the task you just created and select “Run”. 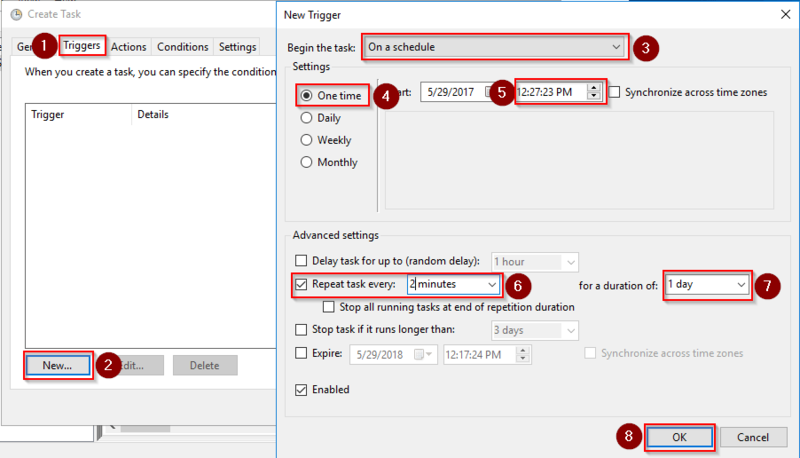 Monitor the “Last Run Time” and “Next Run Time” columns for the next few minutes to make sure it’s running automatically as expected. Now that we’ve sorted all that out, let’s get on and actually deploy the thing. For this example I’m not using DHCP and so will be statically assigning an IP address to my BGPNAT VM as part of the code. I’ll also be using an Azure Active Directory (AAD) account and will be providing that in the code too. The following table give you a little detail on what you should be inserting for the script variables. Once the script hits a certain point, it’ll reboot the system. When that happens, log back on as AzureStack\AzureStackAdmin using the password you provided in the script. If you accidentally log in as .\Administrator, you won’t see the progress of the deployment. Having previously deployed both TP1 and TP2, I sat there waiting for the angels to come down and congratulate me for a job well done. Apparently that’s no longer the case though as the deployment process now works without a hitch…ahh well, no angels for me. Only a few things left to do folks and we can consider this one done. Firstly, we’ll want to activate both the administrator and tenant portals. Launch the Admin Portal and login using the AAD account you used when deploying Azure Stack. Click accept when prompted. By default, the password expiry is set to 42 days, we’re going to go ahead and change this to 180 days. Although IaaS isn’t generally the best use case for Azure Stack, chance are, the first thing you’re going to deploy for testing purposes is a VM As such, we’re now going to prepare and upload a default Server 2016 image to our Azure Stack gallery. Having an image in the gallery is also a prerequisite for deploying MSSQL as PaaS which we’ll be doing in a later guide. Once logged on, the first thing you’re going to need is a Server 2016 ISO, if you already have one of your own, you can use that. If not, you can download an evaluation HERE. When prompted, select the ISO version of the download and choose a save location. 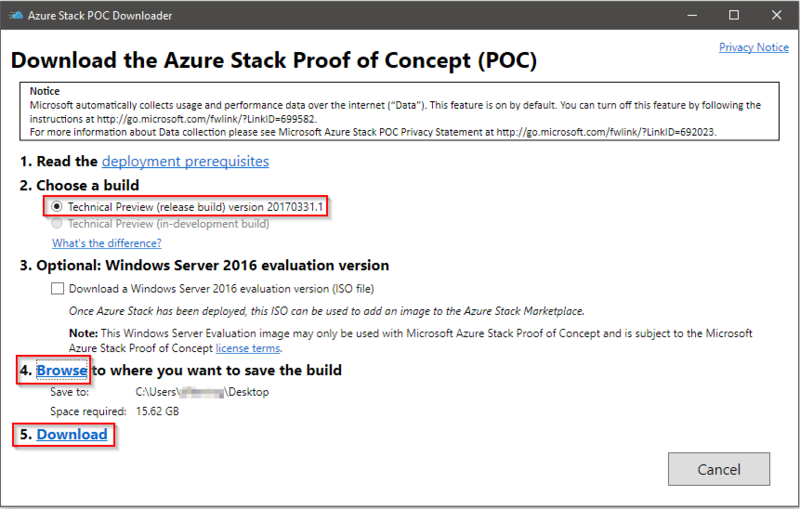 So, we now have an ISO but we’ll still need to install PowerShell for Azure Stack and grab the Azure Stack tools from GitHub. Launch an elevated PowerShell ISE console. Install the 2017-03-0-profile version of the AzureRM modules for Compute, Storage, Network, Key Vault etc. Get-Module -ListAvailable | ? Name -like "Azure*"
The first thing I’m going to do here is install Git for Windows on MAS-CON01, you can download it from HERE and run through the installer accepting all the defaults. Now close and reopen your elevated PowerShell ISE console. If you see the following error, you didn’t close and reopen your PowerShell console…naughty! NOTE: If you change the download directory here, take care NOT to download it to the C:\Windows\System32 directory. 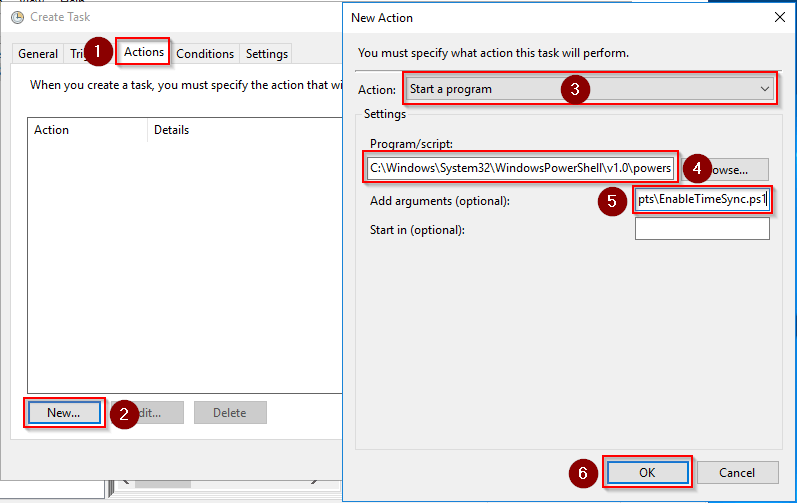 Create and Upload a Default Windows Image…cont. Now we’ll need to import the Azure Stack Connect and ComputeAdmin modules and create the Azure Stack administrator’s AzureRM environment. Now we can FINALLY prepare and upload our Default Server 2016 image. $UserName="<Username of the service administrator account>"
# Add a Windows Server 2016 Evaluation VM Image. NOTE: Is you receive the “WARNING: Unable to acquire token for tenant ‘common'” message during the upload, this can be ignored. Don’t worry if this step takes a while, especially when you see “Downloading” repeated again and again and again! When complete you should receive the following message: “StatusCode: Created”, a little low key considering how long it makes you wait. Hopefully that made things a little easier for someone out there, if not then this’ll be my documentation when I need to run through the process again. Please advise, thanks so much! There have been quite a few changes since I uploaded that guide, so I’m in the process of putting up a new one which should be available in about 2 days time. Hopefully the above will get you going again though.